Veronica is a visual reporter, but rather than capturing moments with a camera, she sketches events at the scene. At international news events like the Tour de France, it’s common to see a string of press photographers and videographers snapping pictures and recording the cyclists whizzing by. But if you were to look closer, you may see a group of artists with their sketchpads out, drawing away . Veronica Lawlor is one such reportage illustrator. She draws what she sees, reporting live from the scene via her artwork. Whether covering an event for professional or personal reasons, she packs a large bag full of colored pencils, pens, watercolors, oil crayons, brushes, graphite and a sketchpad — every tool that might help tell the story. “I tend to do everything on location,” says Lawlor. “You lose the spirit of it once you go back to the studio.” When Lawlor first arrives on site she walks around and makes small thumbnails, and from those decides which larger drawings she wants to make and from what point of view. She generally makes multiple larger drawings in order to present “a larger view of the situation” than one drawing would allow. Each drawing takes between 20 minutes to an hour on average. The drawings evoke visceral emotion, with layered characters who emit an often wistful energy. Her work evokes visceral emotion, with layered characters who emit an often wistful energy. 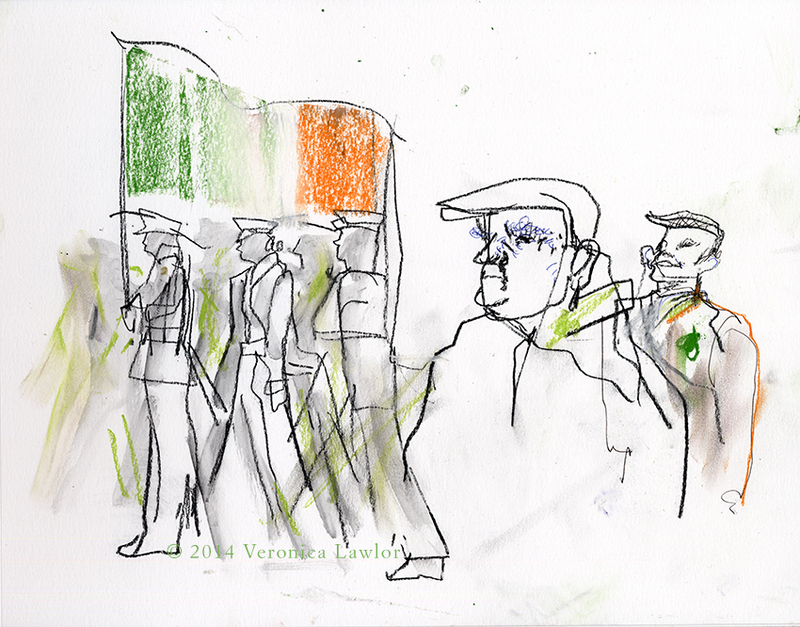 One of her St. Patrick’s Day drawings shows a man with blue squiggly eyebrows standing in the foreground as what looks like a troop of soldiers marches by in the background holding a colorful Irish flag, with many in the large group depicted as charcoal shadows. A reportage illustrator is featured in the new movie Snowpiercer, available in limited release and on demand. Lawlor’s drawings have been shown at the Louvre and featured in multiple books, and her coverage of 9/11 is currently on display in the Newseum in Washington, D.C. Illustration supports her financially and she works with different clients each month: she’s currently working on a book jacket illustration for St. Martin’s Press and several magazine illustrations. In addition to teaching at her own school, she teaches illustration and location drawing at both Parsons the New School for Design and Pratt Institute. Reportage artists are found all over the world. Lawlor co-founded the Dalvero Academy to teach illustration to students, and is part of Urban Sketchers , a group that holds international symposiums every year. There’s an adrenaline and passion captured on the page, an energy in a fleeting moment transposed onto paper. Lawlor’s drawings are a very personal interpretation of reporting, and her work invites you to witness world events large and small through an utterly unique emotional lens.